GHOSTS. Unearthly presences. Things that go bump in the night. St. Augustine, America’s oldest city, has them all. The unique and often turbulent history of the Ancient City has spawned more than four hundred years of shadowy figures of the dark hours. Come walk through misty, cobblestone streets, down shaded alleys, along the wall of the old stone fort. Smell the smoke of ancient fires, the musty corners of old houses, the tantalizing spices of Minorcan kitchens. Listen to the tinkling of wine glasses long shattered, the strum of Spanish guitars long broken, and the laughter of a dozen foreign tongues long dead. Awaken to the midnight howling of the city’s prowling cats; seek sleep between nightmares, lulled by the lapping waters of Matanzas Bay—named for the massacre of French Huguenots by the Spanish here in 1565. 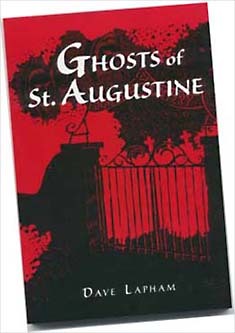 Author Dave Lapham has collected twenty-four stories from St. Augustine’s rich oral history into a light, yet sometimes hair-raising encounter with the spooky side of the Oldest City.